When presented with wine grown and produced in a country that is 98% Muslim (a religion whose dietary law forbids the consumption of alcohol), it is easy to be perplexed. In Morocco, 42 million barrels of wine are produced per year, yet local law forbids the sale of said wine to virtually all of the population. It must, then, be mostly exported, you’re probably thinking. Though technically illegal to sell wine to Muslims, generally it is widely available in supermarkets, and only hard to find during Islamic festivals and the holy month of Ramadan. Domestic sales have taken a hit recently due to tax increases from a more conservative government and the fact that one of the major supermarket chains stopped selling wine altogether, but despite all that Pariente insists that Moroccans are continuing to develop a taste for better quality juice. Though indigenous grapes date back much further – there’s evidence of the Moors (Moops!) 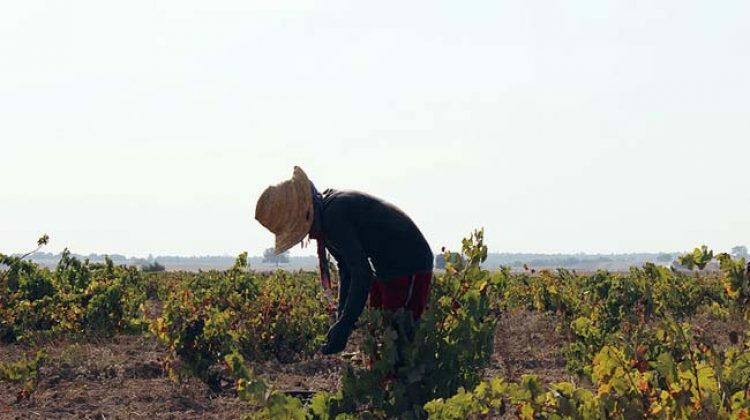 bringing some grapes to Europe – modern winemaking in Morocco can be traced back to French and Spanish occupation of the area starting in the 1800s. Though northern Africa might not immediately bring to mind wine region, the Moroccan climate is actually quite perfect for grape growing, with the cooling breezes of the Atlantic Ocean to the north and west, and rolling hills leading to the Atlas mountains, which insulate the region from the harsh Sahara desert to the east. It’s much further north than one might think, relatively close to Spain and at about the same latitude as Santa Barbara. The 1950s was Morocco’s heyday, when it was the 4th largest exporter of wine in the world, mostly producing what was known as medicine wine, or bulk wine used in France for blending, to add color, tannin and alcohol to lesser-quality table wines. When the French left, however, the industry dried up, however, leaving huge facilities empty and desolate. In the 1990s, King Hassan revitalized the industry, bringing in new French investors and rebooting with an eye towards higher quality wine. The Gallic influence remains strong – all the winemakers in the country are currently French – however the lack of restriction on varieties (There are 14 AOGs, but no variety limits) brings more of a new world flavor to the proceedings. “You have that French know how and approach, but at the same time the beauty of Morocco is that they can use different grapes. You won’t find a lot of single varietal wines because they can play around with blending, mixing things that you might not expect,” says Pariente. Personally I found the wines to have more in common with South Africa than France, not because they share a continent, but because of that same background – looking to and relying on Europe for knowledge and training, but not having the same restrictions in terms of what to grow and what to use, thus also looking to the new world in terms of experimentation and blending. It’s a nice balance of the two, and brings out the best in both. Personally I don’t need much of an excuse to break out the Ras el Hanout, so I found myself relying on that here, even if it’s not as familiar to the American palate as it should be. (If this isn’t yet a pantry staple, I would highly suggest you make it one.) Literally translated to “head of the shop”, it’s implied to signify the best mix of spices a shop has to offer and is widely used in Moroccan cuisine. It relies heavily on warm spices such as cinnamon, turmeric, cumin, clove, coriander, etc, and brings much flavor to dishes without heat. It can be used in place of curry or as a rub on beef, poultry, pork, veggies, etc., and goes incredibly well with any of these Moroccan wines. Watermelon on the nose, with hints of dank resin. Cranberry and more watermelon on the palate lead the way in this straightforward, easy-drinking wine. Excellent acidity will allow it to pair well with a wide variety of light-to-medium weight foods. 60% Faranah (an indigenous grape), 40% Clairette. Nose of honey and sweet fruit. Palate features a mellow green note, grapefruit, peach and almond, and more honey. Low to moderate acidity. Unique and different – one to try for sure for those interested in these wines. A grassy nose, with touches of tropical fruit and jalapeno on both the nose and palate. Smooth and easy to quaff. An approachable Cabernet-Grenache blend with dark fruits and moderate oak influence. With air, the red fruit and herbal elements of the Grenache assert themselves. A good burger wine. A Cabernet-dominant blend that’s a bit more complex than the red blend, with the addition of some gamy notes from the Syrah. A good one to pair with ras el hanout or cumin-spiced lamb. Aged in concrete tanks. Violet and plum on the nose, with a hint of game. Dark fruit, with a touch of caramel on the palate. Elegant but powerful, tannic, but not overly so, modern but food-friendly, this Syrah is harmonious and supremely balanced.